This week has been really flat out, so it feels good to finally be able to sit back and relax with a beer. This is the third of the BridgePort beers I've had over the last few weeks and in terms of style it's a bit different to anything else I've reviewed so I thought we would give this one a go tonight. Kingpin is a double red ale which is triple hopped, this sounds right up my alley as I'm a massive hop head (as some of you may have guessed...). For the most part I find red or amber ales to be a little boring however with the quality of the beers I've had so far from BridgePort and the fact that this one has a bit of a difference, I'm really hoping for a good one. The nose is mostly made up of some sweet caramel malts, which is really the only thing that catches the senses attention unless you strain to find anything else. When you do strain you almost wish you hadn't! There's a slight hint that some citrus and spicy hops have come in contact with this beer but nowhere near enough for a beer that is supposedly triple hopped! It's quite a disappointing nose. 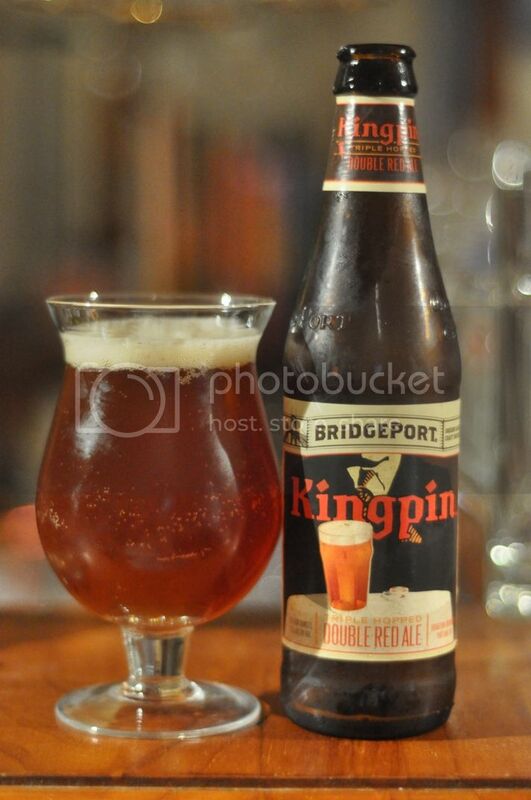 In positive news for Kingpin, the taste is considerably better than the nose indicated it would be. The base of the beer is still predominantly caramel malts however there much more complexity to the taste with the hops that were barely noticeable on the nose providing quite a good hit of bitterness at the backend. There's not a lot of carbonation and it actually makes the beer feel quite weird in the mouth. After having the other two BridgePort beers that came out here (the IPA and the Hop Czar) I was left feeling a little let down by this beer. For me this was just a little bland and boring. Yes there was some impressive bite at the back end, however I would expect nothing less from a triple hopped beer. It definitely was my least favourite of the three but I do know quite a few people (mostly red/amber ale fans) who really like it. If you are a red or amber ale fan it would certainly be worth a try.